Triple ground teeth for faster cutting and 1mm extra rigid steel blade. Large soft grip handle. 8tpi. 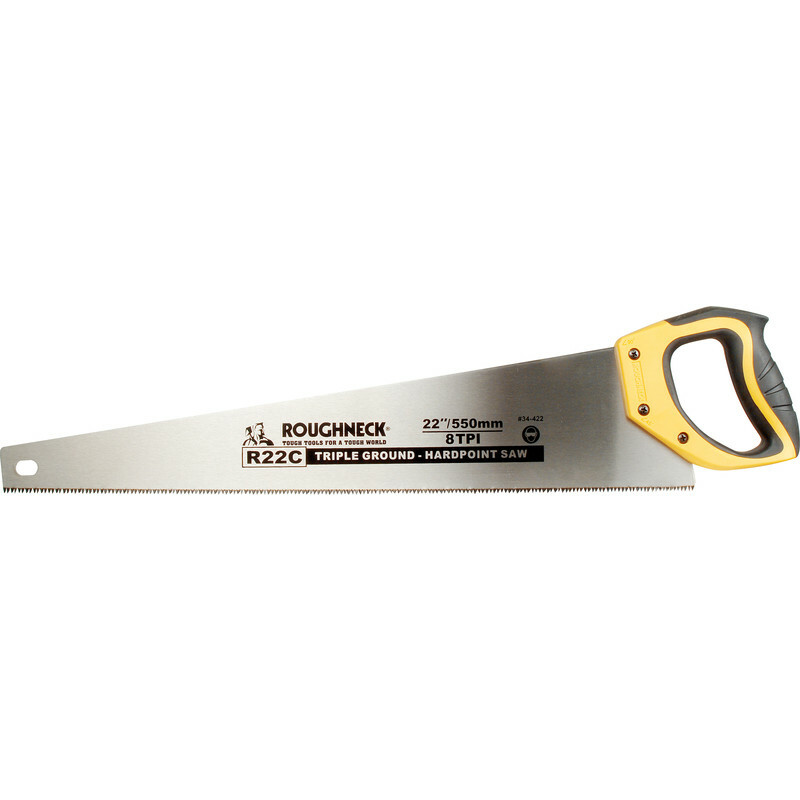 Roughneck First Fix Hardpoint Saw 550mm (22") is rated 3.9 out of 5 by 27. Rated 1 out of 5 by Tommo201920191827 from Worst saw I've ever bought I had a saw in my shed, it was for cutting sleepers, it was relatively cheap but the reviews were good so I ordered it and it was amazing until it became blunt. I was ordering new screws from here and thought I'd kill 2 birds with 1 stone and looked for a good saw. It arrived, very professionally wrapped etc with a little oil on the blade, I thought this is the business... Well how wrong was I.... I began sawing and once it went more than 10mm into the wood it became really stiff to move, I thought it may be the sleeper was wet so I picked up my old saw and it cut through it no bother... I seriously think I either got a dodgy one or the reviews are all fake. Rated 5 out of 5 by melboy from great saw great saw very sharp makes cutting timber so easy. Rated 5 out of 5 by Jimbo ss from Top quality affordable tools I must say I have been buying from toolstation for about 6 years now, never once been disappointed or had to return any items. Just a first rate product at a reasonable and affordable price, guaranteed quality is a byword for toolstation in my opinion.